Gender inequity is still a major problem in the daily work lives of women globally. Harassed on fieldtrips. Excluded from projects. On the receiving end of micro-aggressions. A lack of female role models. These are some of our collective experiences as women working in science and engineering. 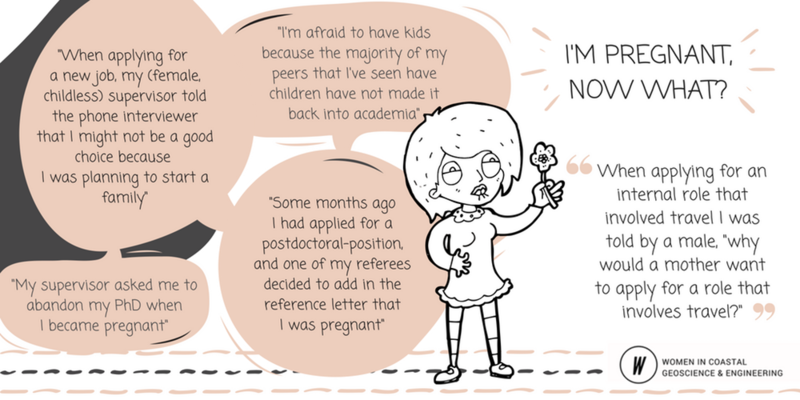 Such experiences erode research opportunities and career progression, leading to the loss of many brilliant women from our disciplinary field – along similar lines as we’ve recently seen exposed in Australian federal parliament. Today we published a global snapshot of the status of women in coastal science and engineering. The results show that gender inequity is still a major problem in the daily work lives of women globally. 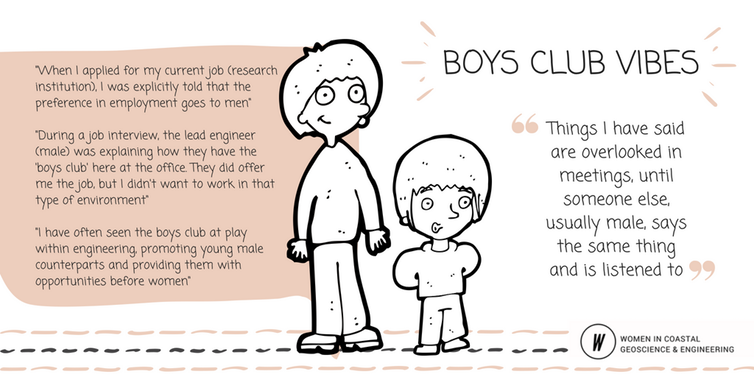 And since gender inequalities in science won’t self-correct, we’ve developed some solutions based on our findings. Image: Naomi Edwards, Author provided. For twenty years people had been telling me how lucky I was to be in our field of research because “things” were changing for young women. This didn’t resonate with my experiences. Twenty years later “things” had not changed and I was no longer a young woman. I started talking to other women and found that they had faced similar challenges, and wanted to see change. To catalyse change, we founded the Women in Coastal Geoscience and Engineering (WICGE) network in 2016. Our first project was a study to understand the main issues faced by women who work in our field. We surveyed 314 members of the coastal science and engineering community and analysed the gender representation in 9 societies, 25 journals, and 10 conferences. 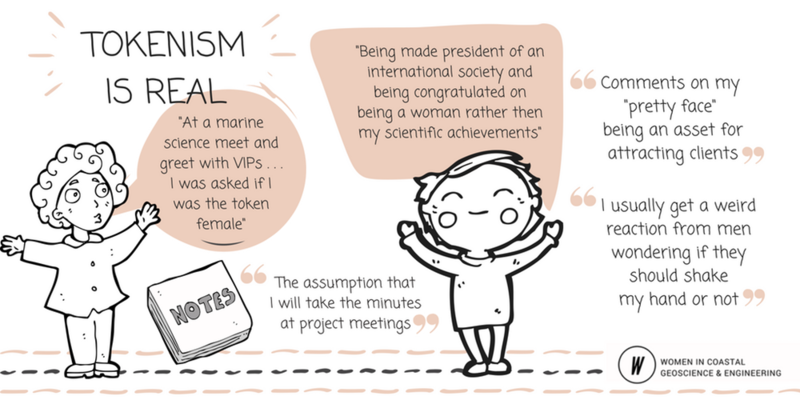 We found that while women represent 30% of the international coastal science community, they are consistently underrepresented in leadership positions (such as being on journal editorial boards and as conference organisers). 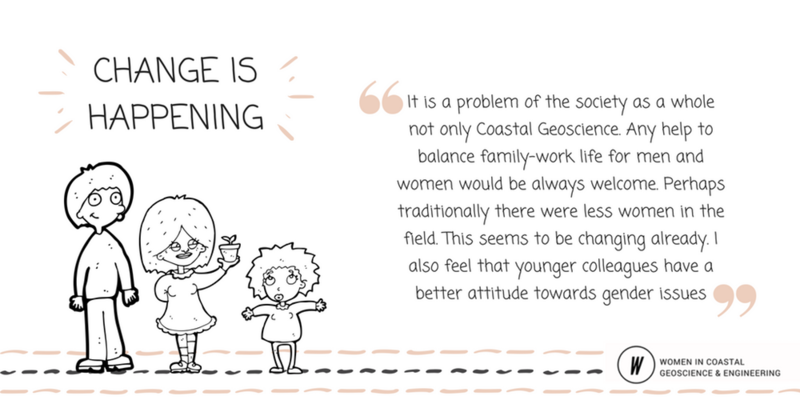 This situation was clearly acknowledged by the coastal sciences community, with 82% of females and 79% of males believing that there are not enough female role models. Are gender quotas in academia a good idea? Female representation in prestige roles was the highest (reaching the expected 30%) only when there was a clear entry pathway that gave women an opportunity to volunteer for a role. Female representation was the lowest for the traditional “invite-only” prestige roles. A significantly larger proportion of females felt held back in their careers due to gender than their male counterparts (46% of females in comparison to 9% of males). widely held assumptions that a woman’s job performance will be impacted by her having children (the “maternal wall”). Fieldwork emerged as a key area of inequity, with female respondents being excluded or outright banned from research ships. For those respondents who made it to the field, many of them reported experiencing gender stereotyping and/or sexual harassment. We used our survey to ask some forthright, open-ended questions about peoples’ experiences and observations of gender equality. As a study author, the day I went over the responses was one that I will never forget. Stories of bullying, abortion and sexual harassment had me in tears at my desk. Inequality was consistent, pervasive and, in many cases, traumatic. Gender imbalances in science, technology, engineering and maths (STEM) are not a self-correcting phenomenon – so here are some ways to make science more inclusive for women. 1. Advocate for more women in prestige roles: Ensure fair representation of women as keynote speakers at conferences, on society boards and journal editorial boards. Have clear pathways to prestige roles giving women an opportunity to apply if they wish to do so. 2. Promote high-achieving females: Recognise the achievements of females, and select them for roles that increase their visibility as role models. 3. Be aware of gender bias: Consciously reflect on personal biases when hiring, promoting and mentoring staff. 4. Speak up, call it out: Point out to conference organisers all-male panels and keynote programs and, where they are underrepresented, write to chief editors suggesting women for editorial boards. 5. Provide better support for returning to work after maternity leave: Higher levels of support and more flexible conditions for women returning from maternity leave encourage women to stay in their employment after having children, thereby increasing their prospects of reaching more senior posts. 6. Redefine success: Recognise the diverse range of definitions of what it means to be a successful researcher. 7. Encourage women to enter the discipline at a young age: Many school-age girls are put off the idea of entering STEM disciplines as they are socially and culturally deemed to be “male” pursuits. This needs to be addressed. 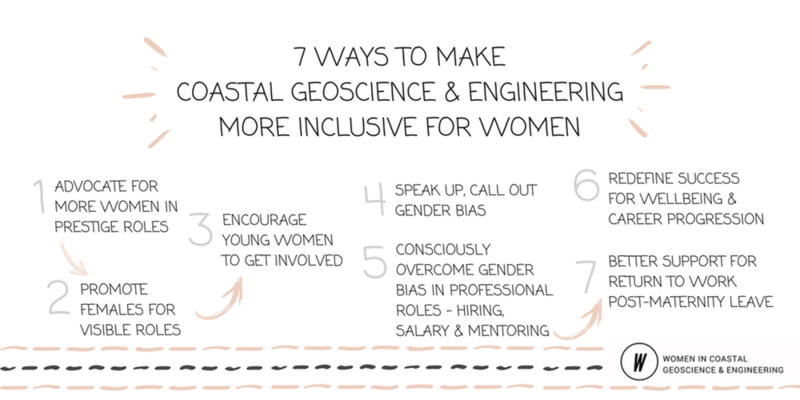 The Women in Coastal Geoscience and Engineering network is already successfully implementing some of these steps. By choosing to ignore inequity for women, you become accountable for allowing it to continue. Speak up, promote the work of your female colleagues and give them voice and visibility. This problem transcends STEM disciplines. It is crucial that the wider community becomes aware of the extent of inequity so that, where necessary, everyone can take action to improve the governance and culture of their work place.